The UN Climate Talks have begun. Heads of state have given speeches, and negotiators are working around the clock here in Paris to hammer our a global climate agreement. It is important to participate in the talks and to push for an ambitious, justice-oriented global agreement. We also remember that at the end of the day, no one is coming to save us. Lives are on the line, we know that millions of people are already being affected by climate change. All of Earth’s systems are unraveling. At this critical moment, we urge global leaders to take action that they so far have not been willing to take. Yet we don’t rest our hopes for the future on these UN talks. The United Nations process is far from perfect. It is widely expected that the climate agreement will not be ambitious enough to avert extreme climate chaos. Right now current commitments from countries add up to a 2.7-3.5 C degree temperature increase. Much more is needed, and ultimately change will have to come from the grassroots, from communities organizing globally. This is the opening ceremony of RunForYourLife, a day and night relay that is passing this small stone to Paris and the start of the COP21 mobilizations. The words that inspired this event are from a Sàmi poem: “Take a stone in your hand and close your fist around it until it starts to beat, live, speak and move.” The Sàmi remind us: “WE STILL SPEAK EARTH”. Earth Guardians passed the stone to a woman from the Marshall Islands to carry inside the COP on the morning of the start of the talks. Civil society leaders taking action! We must be the change we want to be in the world. We must step up as a movement in creating solutions in our communities and linking globally for ecological, social and earth justice. The solutions exist, and they are going to come from the bottom up. We must show leadership now, regardless of the outcome of the UN talks. This is our mission as Earth Guardians. So today Earth Guardian’s delegates stood with impacted communities today who are fighting for their lives for a livable future. We took part in #FastForTheClimate, a global day of fasting as one global family united for climate justice. This began two years ago with the leadership of Yeb Saños. His own family was caught up in Typhoon Hayann, which killed thousands and destroyed homes and livelihoods across the Philippines. In a moving speech, Yeb said he would not eat until the Warsaw conference ended or delivered actions that would ‘stop the madness’ of the climate crisis. So long as the people he represented could not eat, he would forgo food to honor and connect with them. Since then, there has been a constant chain of fasters every day leading up to Paris. 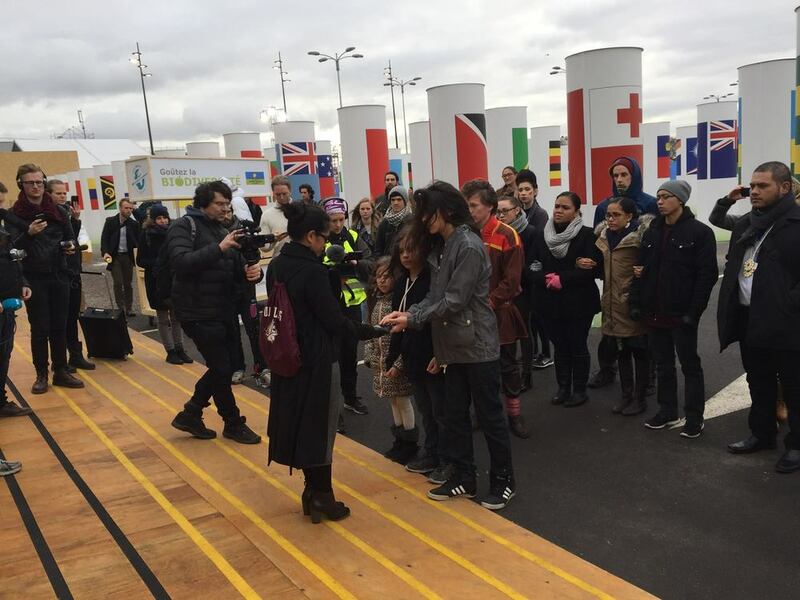 Yesterday thousands fasted together, calling for climate justice action at COP 21. At the end of the day, we ended with a feast of celebration and hope! Xiuhtezcatl, Jaiia and Jonathan all performed poetry at the celebration dinner, bringing so much passion and truth to the room. This day of fasting reminded us to be grateful for what we have in our lives. For us, fasting was a conscious choice. We know that many people around the world, including children, go hungry without a choice in the matter. Climate change is making issues of hunger worse. We are thankful for our lives and the access to food that we do have. There were intentions voiced in our group to remember to be thankful for our food before eat, to take a moment of mindfulness before eating to bless our food and give gratitude for our lives. We invite you to join with us in starting with gratitude for our lives as we do the work ahead for social change and climate justice. Wouldn’t the real progress be to understand the roots of the climate crisis and ensure that humanity never repeats a ravaging of the Earth and its people? I had a visceral reaction to Obama’s phrase because it frightened me that society will march forward without reflecting on the systems and behaviors that created the climate crisis. If we do not reflect, then we are prone to create destructive industries that take advantage of life and love. Instead of Big Oil, what if we have Big Solar? What if renewable energy companies repeat patterns of the fossil fuel economy and disregard the well-being of communities for the sake of energy and profit?